This article first appeared in The Edge Malaysia Weekly, on March 5, 2018 - March 11, 2018. MALAYSIA has yet again missed its tourist arrival and receipt targets, but the sector continues to be the third highest contributor in terms of foreign exchange receipts after manufacturing and commodities. 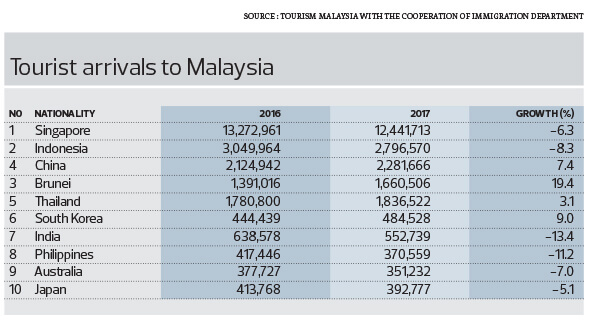 Last year, Malaysia welcomed 25.95 million tourists, a 3% decline year on year. The tourists spent a total of RM82.2 billion in the country, up a marginal 0.1% compared with 2016. The arrival figure fell short of its target for the fifth consecutive year (see table). This year’s target is 33.1 million tourists and RM134 billion in receipts before peaking in 2020. Will the country be able to achieve the goals after missing the targets from 2013 to 2017? Tourism Malaysia director-general Datuk Seri Mirza Mohammad Taiyab believes the country is on track. “The swing will be upwards and we are confident about it,” Mirza tells The Edge in an interview. Thailand, for example, welcomed 35.3 million tourists last year, up from 32.6 million in 2016. Singapore’s tourist arrivals hit a record high of 17.4 million, a 6.2% increase y-o-y. As for Indonesia, arrivals grew 21.84% to 12.68 million in the first 11 months of last year. Mirza’s confidence also stems from positive forward bookings and tourism growth regionally. “Towards the end of 2017, there was a spike in visa applications from India and China. Our earliest indicator is visa applications, followed by [forward] flight bookings. Both are showing an upward trend,” he says. Tourism Malaysia, as the marketing arm of the Ministry of Tourism and Culture, has been focusing on easing the flow of visitors into the country. This, too, has started to show positive results. The reversal from the downward trend is welcome, given the tough five years the industry had faced. In 2013, the plan for Malaysia Airlines and AirAsia to work together saw an impact in term of seats offered and seats supplied. The following year, there was the MH370 incident. “The incidents (flight disappearance and crashes) involving MH370, MH17 and [an] AirAsia [plane] in 2014 saw their effects reflected in 2015. The worst part was, there was no closure for [the passengers’ next of kin of] MH370 … the stories kept repeating,” Mirza says. “We cut back on advertisements from April 2014. We could not have an advertisement with people dancing when there were still people crying at the airport. Despite the brighter outlook going forward, he acknowledges that this year will not be without challenges. He says neighbouring countries have a lot of resources and appear to be dominating the media scene. “[Advertisements on] Guam, Vietnam, the Philippines and Indonesia are very prominent in Japan. We are losing out to these substitute countries. Yet, another challenge is the need to enhance accessibility through point-to-point connectivity to Malaysia. As at October 2017, Malaysia had 645,285 seats per week, while Singapore had 813,118 and Thailand, 945,306, from various airlines. “Convincing international airlines to establish routes to Malaysia is not an easy task, but we will have to persuade them ... on the feasibility and profitability of such an investment,” Mirza says. Last year, 67% of Malaysia’s tourist receipts came from short-haul flights (flights below two hours), 19.5% from medium-haul (two to six hours) and 12.8% from long-haul (six hours). The country saw arrivals from 22 of the 45 top tourist arrival countries decline in 2017 from 2016. The biggest drop in terms of the number of tourists was from Singapore — Malaysia’s top tourist nation — down 6.3% to 12.44 million. The number of tourist arrivals from Indonesia declined 8.3% to 2.79 million. “Instead of spending two to three hours on the Causeway, they can fly and be on a beach somewhere,” Mirza says of the arrivals from Singapore, adding that the strong currency also provided Singaporeans with a wider choice of holiday destinations. Nevertheless, Singapore and Indonesia remain the first and third highest contributor to revenue with the former bringing in RM36.9 billion in receipts and Indonesia, RM8.5 billion. China, while ranked only third in terms of tourist arrivals to the country, added RM9 billion in receipts. 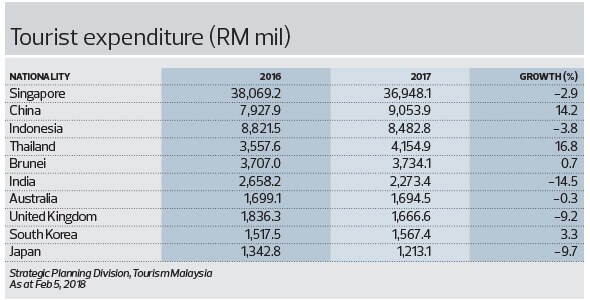 Meanwhile, the per capita spend of the tourists — defined as those who stay at least one night — last year rose 3.2% y-o-y to RM3,166.50. However, the average night per tourist declined 0.2% to 5.7%. In general, Middle Eastern tourists tend to be the biggest spenders, with Saudi Arabians at the top. However, arrivals from some of these countries have been declining — Saudi Arabia was down 18.8%; Iraq, 17.7%; and the United Arab Emirates, 39.5%. It is worth noting that Emirates flies the Dubai-Kuala Lumpur route three times a day during winter and four times a day during summer, while Etihad serves the Abu Dhabi-Kuala Lumpur route twice a day. This means many of the passengers are only on transit here. “We realise that we need to refocus on the UAE market with a strong and fresh branding campaign,” Mirza says. On a positive note, FowardKeys says Middle East arrivals to Malaysia in January rose 13.9%, with those from Saudi Arabia up 34.2% and UAE, 5%. ForwardKeys is a data analysis firm that provides intelligence by predicting future travel patterns. This year, Tourism Malaysia has been allocated RM300 million to RM190 million for operational expenses and RM110 million for advertising activities. However, the allocation from the Tourist Tax is pending at the Ministry of Finance level. The collection will be used to boost tourism. The tax, which came into effect on Sept 1 last year, requires guests to pay RM10 per room per night and this is applicable to all hotel categories. On the 2020 target of achieving RM168 billion in receipts, which is double that of last year, Mirza says, “It is a given target and we are supposed to work towards it. The assurance that we have is we have the capacity.” According to him, the average hotel occupancy is hovering at around 60% to 62%. Tourism Malaysia will also be receiving an additional allocation for Visit Malaysia Year 2020 but the amount has yet to be finalised.